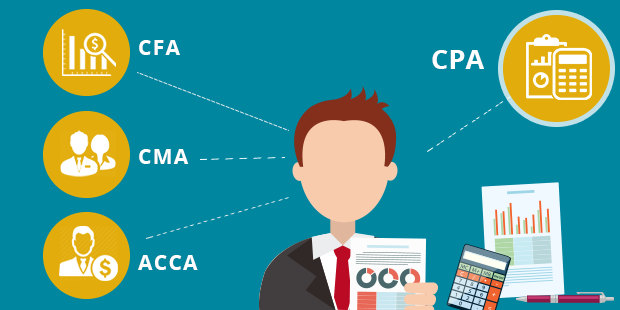 CPA vs CFA vs ACCA vs CMA: which one is the right credential for you? The Accounting industry offers you various opportunities to learn via various courses. You can choose which one suits your academic and practical requirement. Along with Accounts, finance industry also beneficial for you to pursue in today’s professional world. The question is – After your graduation which accounting or financial credential should you pursue? We have investigated, researched and compared many courses to CPA. To help you taking a right decision, we’ve compared most popular credentials like CFA® Program, CMA and ACCA with CPA. A Certified Public Accountant is the highest standard of competence in the field of Accountancy across the globe. The exam is administered by the American Institute of Certified Public Accountants (AICPA), which is the world’s largest accounting body. In order to appear for Certified Public Accountant Examination, the candidate should be a B.Com with PG. Indian CA’s with B.Com are also accepted by quite a few states in the US. However, the exact criteria will vary from State to State. Chartered Financial Analyst® is a professional credential offered by the CFA® Institute to Investment and Finance professionals. The CFA® Program has three different Levels and the minimum time required to clear all three is around 2.5 years (although the overall average is around 4 years). ACCA( Association of Chartered Certified Accountants) is the world’s leading and fastest-growing international accountancy organization which provide high standards of employee learning and development. ACCA provides you skills and knowledge about all areas of business, financial statements, management accounting, business taxation and also business ethics. Certified Management Accountant is a globally recognized, advanced-level credential offered by the Institute of Management Accountants (IMA) USA and the content is regularly reviewed by the Institute of Certified Management Accountants (ICMA). The CMA course enhances the value of your current position and expands your career potential. Since it is not possible to say which course you should target, it’s your decision which one is better for your career or which is more suitable to your academic qualification. In terms of which qualification is better, it is like a question on which Cricket team do you support among South Africa, Australia, England and West-indies. It really depends on what do you plan to work as. Still confused about the right career choice? Book a career counselling session with us! However, if you’re seeking an accounting job in the U.S., don’t overthink and go for the CPA. EduPristine provides training for the CPA certification that will help you to clear the CPA exams easily. We hope this comparative analysis will help you in choosing the right career for yourself. In case of any queries or doubts about these certifications, feel free to comment below.